Every person includes the entire universe – a vast, endless egoistic desire. In addition to this, each person has one other point, called the point in the heart. 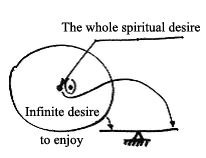 This point contains the entire, endless, future spiritual desire. It’s just that it is presently concealed from the person, and manifests only as a point of desire. This is the point that one must develop within. At the same time, the egoistic desire will keep on growing in order to force the person to develop this point. You can argue, “But the desire is so great, while the point is so tiny!” However, that isn’t so. The desire within this point will always be commensurate with the general corporeal desire. These two desires within a person are always in balance.